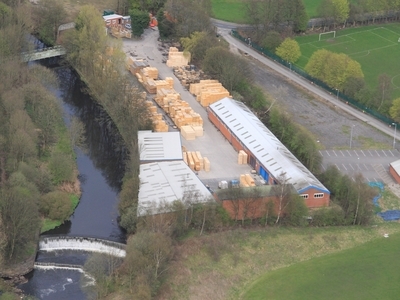 Conquest Joinery, based in Manchester, specialise in designing and manufacturing heat treated wooden pallets, wooden packing cases, sheds, wood fencing, log cabins, timber decking materials and more. We also stock a wide range of concrete fencing products. Here at Conquest Joinery, we are committed to quick and efficient turnaround times on all our deliveries of wooden pallets and other joinery products with a nationwide delivery service. Our main business is the manufacturing and distribution of bespoke wooden pallets to a wide variety of companies. We are looking at over a million wooden pallets each year manufactured by Conquest, however, we do our bit to look after the environment. You can also get used pallets from us or should you have old, broken or used pallets, you can bring them to us to have them repaired. We also supply the general public and will design bespoke timber products to buy from all other areas of the business, including made to measure garden sheds and fencing. No job is too big or small! We now also stock an extensive range of timber decking and associated products to buy. All of our timber products are manufactured using wood from sustainable sources. Our wooden sheds and fencing are protected with a unique treatment process for unrivalled quality and durability. From the floor right through to the roof, our garden sheds and log cabins are all made using the highest quality T&G timber boards. We also offer an erection service on all our sheds and fencing. For more details, to buy wood pallets or packing cases or to place an order, please contact us or visit our site in Bolton, Manchester which is open 7 days a week. I'd like to thank you for bringing my shed so quickly. I had been let down by another company and desperately needed the shed quickly to house my chickens. Your guys worked in the snow for me and the chicks are now warm in their new home. Thank you so much, i will recommend you to everyone. We are very pleased with our new shed and your help in delaying delivery due to the adverse weather conditions. Thanks to everyone concerned with the sale and to the guys who delivered and erected the shed. I know if i'd have dealt with one of the bigger garden retail outlets i would not have received the same level of service and that is very refreshing to encounter. Conquest Joinery recommended using their fence erector Mick Knowles and we have been extremely happy with the work he carried out. We wouldn't hesitate to use his services again and to recommend both him and Conquest Joinery to others. We recently bought 2 sheds from Conquest Joinery and our whole experience from speaking with Barbara in admin to having the sheds erected was brilliant. Barbara helped no end and was a font of all knowledge. She even made shed-buying fun! The men who came to erect the sheds were very polite, helpful and understood what we wanted and where we wanted the sheds. They explained if there was a potential problem with our requests and suggested remedies. We never realised there were so many things which needed to be taken into consideration before putting up a shed. We are sure if we had bought from a well known DIY superstore we would never have received this service or advice. We would certainly recommend Conquest Joinery to anyone thinking of buying a shed, and we imagine they have the same ethos for all their products. The potting shed is fantastic. This afternoon's numeracy lesson went out of the window because the children were so excited watching it being built. They are already planning what to grow and how to use it - I'm going to have my work cut out! Thank you once again. We really appreciate your kindness. I have recently had a 7x5 Hastings shed delivered and assembled by you, also I have taken delivery of fence panels and I am so impressed with the quality of service and workmanship that I felt I should write and congratulate your Company. The fence panels are of extremely strong construction and will withstand whatever weather we are faced with. As for the shed, it is a quality product manufactured to the highest standard and the two members of your staff who delivered and assembled it are a credit to your organisation and themselves. The quality of their workmanship was excellent and the service that they and your Company provided is second to none. I would have no hesitation in purchasing from Conquest Joinery on future occasions and would recommend to anyone who is looking for good quality products that will last.